I am sorry to say that a member of our blues community passed on last weekend. Smokin' Joe Kubek had a heart attack just before going on stage, and he has left us much too soon. I loved his style, and his partnership with Bnois King made a lot of wonderful music for us to enjoy even if he is no longer with us. Below is a Chicago Blues Guide review I wrote for their new CD that I wrote earlier this year. If you get the chance, please buy a copy of the album to show your support for these gentlemen. 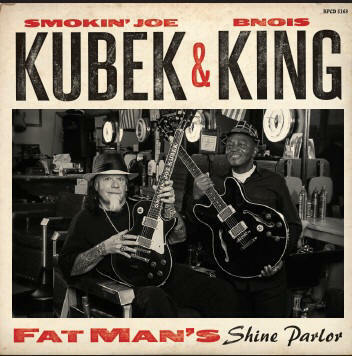 It is so cool to find an album that was cut by professional musicians that sound like they are having a blast and doing what they were born to do, and a perfect example of this is Smokin’ Joe Kubek and Bnois King’s Fat Man’s Shine Parlor, a killer disc from their recent return to the venerable Blind Pig Records label! Smokin’ Joe Kubek was born in Pennsylvania but grew up in Irving, a suburb of Dallas, Texas. He is an incredible blues guitarist, and has worked and played with some of the finest in the genre, including Freddie King, Albert King, B.B. King, and his good friend, the late Stevie Ray Vaughn. B.B. even let him play his guitar, Lucille, and how many people can say they have had that opportunity? His partner in crime is Bnois King, who is no relation to any of the Kings listed in the previous paragraph. Bnois hails from Louisiana where he grew up embracing the traditions of jazz music. He brings a lifetime of experience to the duo, and once you hear him play and sing it you will understand the benefits of over 60 years of practice and gigging -- he picked up his first guitar when Truman was in the White House! 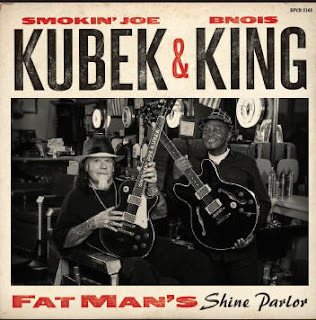 This duo has been together for over 25 years, and the Kubek-produced Fat Man’s Shine Parlor is their 17th album together; it has twelve original tracks, all written by them. King provided the vocals and guitar for this project and (of course) Kubek brought his guitar too. They were joined in the Dallas, Texas studio by bassist Sheila Klinefelter and drummer Eric Smith, and they are as good of a backline that you are going to find! Also, Dallas guitar restoration guru Kim Lafleur joined in on three tracks where even more guitar was needed, resulting in a truly cool effect. The duo has used their diverse backgrounds to bring out the best music of their adopted hometown, and they crank out righteous Texas blues like there is no tomorrow. They kick off their set with “Got My Heart Broken,” a guitar-heavy boogie with Kubek, King and Lafleur in perfect sync. Even with this strong frontline of guitars, they keep a bare-bones mood to the song as Klinefelter and Smith keeping a steady but simple beat. The icing on this cake is King’s crystal clear vocals, which are given with a perfect mix of power and inflection. The band does not let up as they carry their triple guitar attack over to “Cornbread,” which has seemingly innocent lyrics, but King’s delivery makes it seem like he is not really singing about food. After trading riffs and innuendo for three minutes, they slow down a bit for “Diamond Eyes,” a medium-tempo blues rock ballad that allows for a majestic AOR-style guitar break. After this, on “Crash and Burn” the band embraces early rock and roll / surf rock with some neat backbeat drumming from Smith and growly bass from Klinefelter. “Brown Bomba Mojo” is a catchy rock tune with a precise doubled guitar riff that keeps repeating, and this song provides Smith with a chance to really cut loose behind the drum kit. The late Steve Hecht, founder of Piedmont Talent, gets co-writing credit on this song, and this killer track it is an apt celebration of a man who helped some of the beloved artists of the blues world. It would be silly to think that two guitar heroes could get together in the studio and not come out with at least one instrumental, and Kubek and King do not disappoint. “Lone Star Lap Dance” is a light-hearted shuffle with plenty of guitar acrobatics, and a funky walking bass line from Sheila. Towards the end of the disc, the lyrics stick with the traditional blues subjects, including the travails of life on the road (“How Much”), the restlessness of not being satisfied with what you have (“One Girl by My Side”), and then eventually getting caught stepping out on one’s significant other (“Done Caught the Blues”). Each of these tracks paints a vivid picture and highlights what mature songwriters these two are. Finally, after almost 50 minutes, the album comes to a close with “Headed for Ruin,” an outlaw blues song that reminds the listeners that this record was cut in the Big D.
Smokin’ Joe Kubek and Bnois King’s Fat Man’s Shine Parlor is a fun album of rocking Texas blues, and if you are a fan of theirs, or even if you just love rocking blues, buying a copy would be a wise decision. Their energy and synergy are obvious on this disc and their enthusiasm carries over to their live show too, so check out Joe’s website at www.smokinjoekubek.com for tour dates as they will be hitting venues in the South and East Coast states over the next few months!